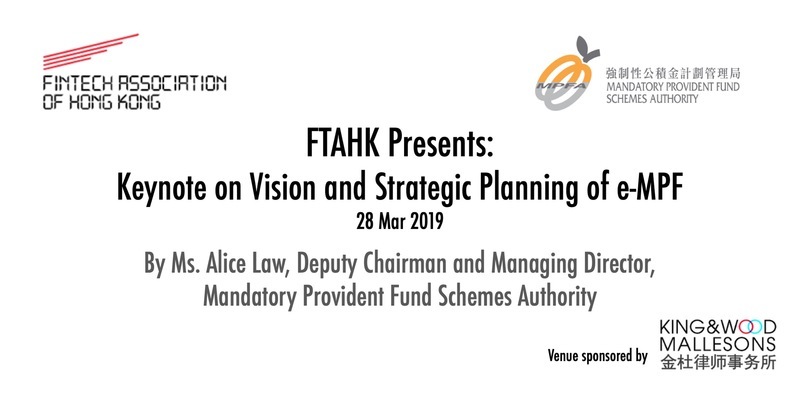 Fintech Association of Hong Kong is honoured to have Ms Alice Law, Deputy Chairman and Managing Director of the MPFA share with FTAHK Members the vision and strategic planning of this important initiative. The MPFA aims to leverage Fintechs to assist in converting this vision into a state-of-the-art tech-centric reality. Through the design of a game-changing centralized platform, dubbed the eMPF, the Mandatory Provident Fund (MPF) System aims to achieve a higher degree of account portability, catalyse market competition, create more room for fee reduction and improve user experience. The MPFA aims to leverage advanced Fintech solutions and visionary digital economy applications to harness the concept of smart administration, so that employees can enjoy barrier-free account management across different providers and throughout their entire career life. Besides wealth management firms, this session will be very useful for technology firms, consulting firms and business reengineering firms that would have an interest in the eMPF initiative.